But when clashes between Koa and the Alchemic Order put a final, deadly squeeze on the remaining Civilian territories, Zeika finds herself in the crosshairs of fate. She must walk the line between survival and rebellion against the Alchemists. On one side of the line awaits death. On the other, the betrayal of her civilization, her loyalties, and herself. The first volume in THE BOOKS OF EZEKIEL series, GHOSTS OF KOA is a fast-paced, post-apocalyptic survival tale, set in the streets of a dying city that has been crushed by alchemic law. 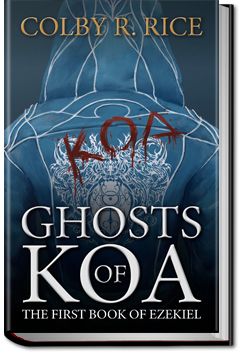 Layered with the elements of gritty crime drama, dark urban fantasy, hard sci-fi, and horror, GHOSTS OF KOA is a wild ride to the end of a young girl’s sanity as she struggles with an impossible choice: to keep one step ahead of a war… or to be consumed by it. This entry was posted in Action/Adventure Books and tagged allyoucanbooks cancel, download free audio books, free audiobook downloads, free e books, free ebooks, unlimited action and adventure books, unlimited ebooks, on August 30, 2014 by allyoucanbooks.